The “honey do” list is alive and well in April as warmer weather means it’s time to tackle home improvement projects. Start by focusing on your bathroom. Get invigorated and gain a feeling of accomplishment by making a home projects checklist that allows you to really accomplish things in a single day. Project #1 – Remove and thoroughly clean any window screens so your bathroom can welcome in fresh, clean breezes. Project #2 – Replace an old, water-hogging toilet. 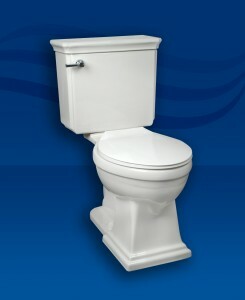 Invest in a WaterSense® rated toilet, like the Brentwood HET, and start saving on water bills with every flush. Project #3 – Brighten up the bathroom with new lighting fixtures. Project #4 – Stop stuffing things in the back of your drawers. Clean out existing bathroom cabinets and drawers. Add in shelving units and under-counter stackable storage containers to maximize valuable bathroom space. Project #5 – Toss out worn or moldy shower curtain liners, towels and bathroom rugs and replace with coordinated new items. Project #6 – Get colorful. Repaint your bathroom (using mildew- and moisture-resistant paint like PermaWhite from Zinsser) in a new color to change the look and feel of your bathroom. Project #7– Take apart ceiling exhaust fans and give them a good cleaning. Project #8 – Upgrade your sinks. Toss out your 1960s or 1970s era sinks and replace with newer, more contemporary styles, like the Verona pedestal lavatory or the Razionale above counter vessel. Project #9 – Look at your bathroom “hardware.” Replace your outdated towel rack and toilet paper holders … and consider adding new cabinet and drawer knobs and pulls. Project #10 – Splurge. After making some necessary enhancements to your bathroom, shop online and add some “niceties” that make life better … like candles, new soap dispensers and toothbrush holders.